I've said it before and I'll say it again, Maria V. Snyder is, and always will be, my favorite author of all time, so I knew before I even read the first page that I was going to love this book and of course I did! 'Shadow Study' is the fourth book in the study series, and carries on after the ending of ' Spy Glass', the spin off series from the world of Ixia and Sitia but from a different character's perspective. 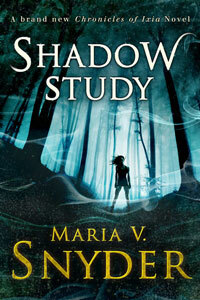 Unlike her previous books in this series, Shadow study is written from various point of views. Yelena's POV continues to be written in the first person narrative as she is still the main protagonist of the book, but alongside that you have chapters being written in the third person narrative from Valek and Janco's POV. I loved this style of writing! It meant that you got to experience the story line from your other favorite character's perspective, learn and understand them on a new level and also fall in love with them even more! By writing the book from multiple POV, the story line was able to go off in different directions. The chapter's alternate between Yelena in Sitia, Valek in MD 1 or on the way to save Yelena and Janco with the Commander or on a secret mission that Valek has assigned him, whereas before you heard about were Valek was going and what Janco would be doing but never got to experience it. This allows you as the reader to experience every angle of the story without it sounding like three separate stories, which is all down to Snyder's incredible skill as a writer. I loved the growth in the character's as well. Being set 8 years after Poison Study you get the sense of growing with the characters. Their joy is your joy, their sadness if your sadness and during the fighting scenes you feel as if it is your own loved ones lives hanging in the balance! Overall this is an amazing continuation of an already amazing trilogy, and somehow Maria V. Snyder manages to make the whole series even better! If you are looking for a new fantasy read that is unlike anything you've previously read by a new author give the first book (Poison Study) in the series a go! I have never met anyone that hasn't fallen in love with these books or has had a bad word to say about them!